after 20h of studying how to mod AMI-Bios (there is a lot of incomplete information out there) I don't know how to work on. I don't know why there where the AM2+ microcodes (1022) within the Bios V1.A of the 890GXM-G65 (it's an AM3 board just like my one but with AM3+ Support), I just took them because of beeing available there! 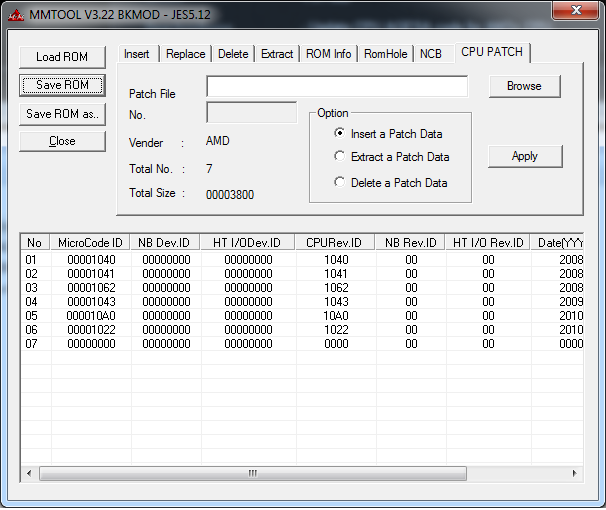 "CPU MicroCode Patch Module does not exist in ROM Image." I've also tried ASRock 770DE3L & 880GM-LE FX, both with the same error in MMTOOLs. After we've got the AM3+ microcode patch, we'll need to replace the P6 microcode, right? If there is absolutly no chance to get the microcode patches, I've read anywhere about Linux-microcodes to be implemented into the Bios, mainly in context with Intel CPUs/MBs. But how to implement that then...? Why all that? First, the Touchsmart supports only 4(!) types of AM3 CPUs, I think it's because the coolers max. TPD is 65W. 2nd: available Dual-Core is to slow, Trible-Core gets to hot, will need to use an Athlon or Phenom II X4e-CPU for it. Better would be an AM3+ Opteron 3320EE with a TDP of only 25W(!! ), this should be perfect for this All-In-One-Device! APP78-CF (Jesse) don't support AM3+ CPU. It's hardware limits and can't be solved by BIOS editing. I've removed the lock from this BIOS and it can use all AM3 CPU. But this mod can kill this motherboard. I think that its integrated graphics can't use system memory with 1333 Mhz.